Have done a lot of googling, tried reinstalling node.js using the official installer, but my npm pathing still doesn't work. But how can I correct my nodejs install so I can simply type 'npm' ? 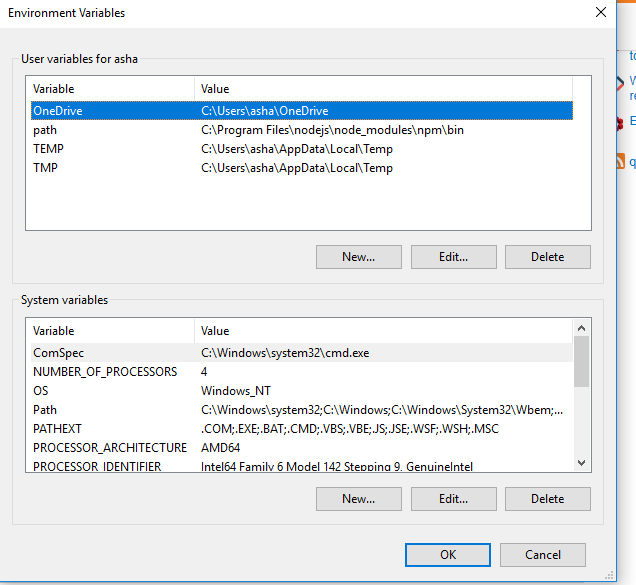 Use the global Search Charm to search "Environment Variables"
Click "Edit system environment variables"
Click "Environment Variables" in the dialog. In the "System Variables" box, search for Path and edit it to include C:\Program Files\nodejs. Make sure it is separated from any other paths by a ;. You will have to restart any currently-opened command prompts before it will take effect. Go to control panel -> System -> Advanced System Settings then environment variables. 1.) Search environment variables at your start menu's search box. You may also Visit this link for more info. I have used the cmdlet and navigate to the path you want to switch your npm files to. Type in npm root -g to see what the current path your npm is installed to. Next use npm config set prefix and your npm path will be changed to whatever directory you are currently on. In my case I had to just switch to version 8.5.0 and then switch back again to 8.0.0 and it was fixed. Apparently NVM sets the PATH variables whenever you do that switch. change the path for nodejs in environment varibale. I've had this issue in 2 computers in my house using Windows 10 each. The problem began when i had to change few Environmental variables for projects that I've been working on Visual studio 2017 etc. After few months coming back to using node js and npm I had this issue again and non of the solutions above helped. I saw Sean's comment on Yar's solution and i mixed both solutions: 1) at the environmental variables window i had one extra variable that held this value: %APPDATA%\npm. I deleted it and the problem dissapeared! Now you can write your command in prompt or powershell. Is there a way to run MJML in PHP?